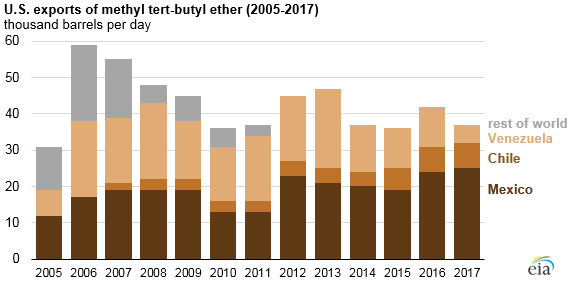 U.S. exports of methyl tert-butyl ether (MTBE), a motor gasoline additive, totaled 38,000 barrels per day (b/d) in 2017, primarily to Mexico, Chile, and Venezuela. MTBE was once commonly used in the United States but was phased out in the late 2000s as a result of water contamination concerns. Since then, fuel ethanol has replaced MTBE as a gasoline additive. MTBE is a fuel oxygenate that boosts octane ratings and helps achieve more complete combustion in gasoline engines. Since 2005, most U.S. exports of MTBE have gone to Mexico and Venezuela, with increasing exports to Chile. In 2017, Mexico accounted for two-thirds (66%) of U.S. MTBE exports. Economic instability in Venezuela may have contributed to the decrease in U.S. exports of MTBE to that country in recent years. Overall, MTBE accounts for a small portion of total U.S. petroleum product exports, averaging 0.7% of the total in 2017. MTBE is used as an oxygenate instead of fuel ethanol in those countries, in part, because it has lower evaporative emissions, can be shipped in pipelines alongside finished petroleum products, and does not require the kinds of infrastructure investments specific to ethanol. Virtually all U.S. MTBE exports originate from the Gulf Coast, where production is concentrated. MTBE can be blended with motor gasoline blendstock in the United States to produce a finished product that is subsequently transported to destinations in Mexico. MTBE was once a common fuel additive in the United States. 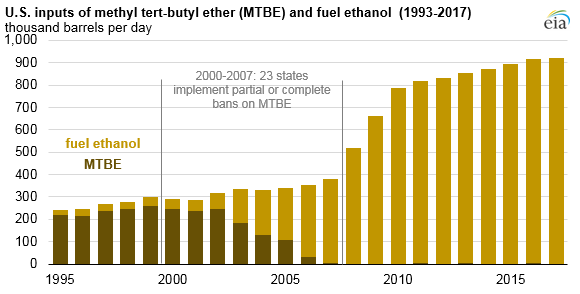 U.S. blending of MTBE into motor gasoline peaked in 1999 at 260,000 b/d. In that year, the volume of fuel ethanol added to motor gasoline totaled 38,000 b/d. However, between 2000 and 2007, 23 states instituted a partial or complete ban on MTBE blended into motor gasoline because of groundwater contamination concerns. The result was an eventual phase out as a fuel oxygenate in the United States and a decline in domestic MTBE consumption that was replaced with ethanol. In contrast to MTBE, the use of fuel ethanol has been supported by tax subsidies such as the Volumetric Ethanol Excise Tax Credit and by the Renewable Fuel Standard, which mandates the use of biofuels in the nation’s transportation supply. As a result, almost all motor gasoline in the United States contains 10% fuel ethanol blends.